Since the State Fair’s defunding in 2009, a community coalition of concerned residents, businesses, professionals, community organizations and more, has been working to provide citizen input on the best uses of the site. 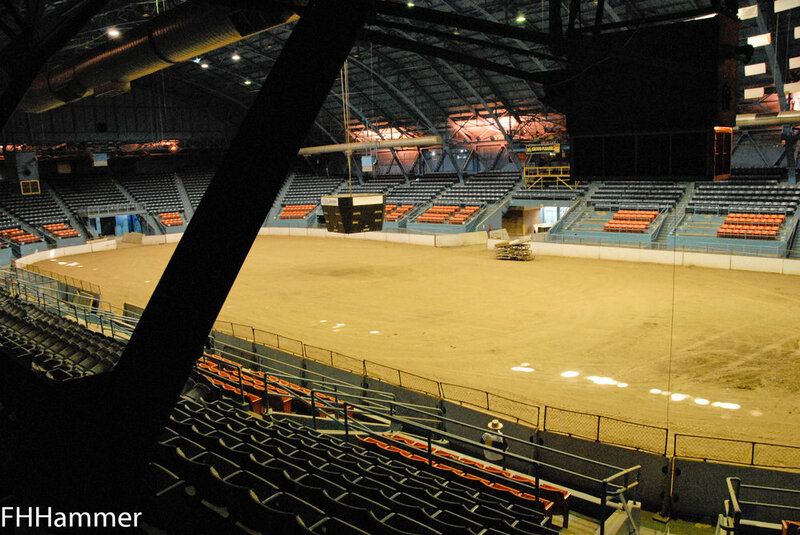 Interior of the State Fairgrounds Coliseum, 2012, photo by Frank Hammer. Those efforts coalesced into the State Fairgrounds Development Coalition (SFDC), which put forward a conceptual, award-winning, plan drawn up by architects and landscape architects called “METAexpo” — Michigan Energy Technology Agriculture Exposition. Many of the pages of this website are devoted to explaining the METAexpo approach and all the features of what we think makes strategic sense — for the communities immediately around the site, for the city, the tri-county region, and the state. The other approach had its roots back in the late '90s long before the State Fair was defunded, when political forces in the state began demanding that the State get out of the business of running the State Fair. The Mackinac Center for Public Policy and others advocated privatizing the public’s 160 acres for private development. In 2012 they secured legislation (Public Act 74), fulfilling their goal. In short order, the state selected the bid of private developer, Magic Plus LLC, headlined by Earvin “Magic” Johnson, and chaired by Lansing Developer, Joel Ferguson. Their proposal: a suburban-style 1990s auto-centered mall complete with a Cineplex, market-rate housing and about 47% of the land devoted to surface parking. In the five years since, the SFDC has worked to push Magic Plus LLC and the Michigan Land Bank Fast Track authority (MLB) — the state office responsible for the site — to adopt the METAexpo’s strategic vision. Changes in the various presentations by Magic Plus LLC since 2013 demonstrate that the SFDC (with the support from concerned stakeholders) has had some impact. But in some key defining features, that influence has not been enough — for example, the role of transit. We continue to work for an economically viable plan that will endure for the next half-century and more. That’s where you come in — as someone who wants to see forward thinking and planning at the intersection of Woodward and Eight mile. Do you want a dynamic site that will catapult development and job creation, and serve as a catalyst for retaining Detroiters and attracting visitors (especially millennials) to Detroit, and the region? The SFDC wants to give voice to your goals and aspirations for the site, and invites your input. SURVEY: We urge our website visitors to complete a survey on line, which you can find here. This survey was developed by Michigan State University's Department of Sociology. If you have concerns or questions about this study, such as scientific questions, how to do any part of it, to participate in other parts of the study, or to report an injury, please contact the researcher, Dr. Marya Sosulski, by phone at (517) 303-0130; email: sosulski@msu.edu, or standard post: 655 Auditorium Rd. #228, East Lansing, MI 48824. We also invite you to get involved with the Coalition by attending one of our upcoming meetings listed on our Events page. Click here to Sign up to receive email alerts. Collectively we can and will make our voices heard! In 2013, the MLB and Magic Plus LLC signed several agreements that were to lead to Magic Plus LLC’s acquiring the site on 2014. But today Magic Plus LLC is seriously in arrears in fulfilling the legal requirements. The land remains under the jurisdiction of the MLB, which has since been absorbed by the Michigan State Housing Development Authority (MSHDA). The historic buildings are falling into disrepair, and the site is currently being used as a storage lot for shipping containers. Maurice Cox, Director of Detroit’s Planning and Development Department, officially weighed in on the site’s future at a Sept. 1, 2016 public meeting, vowing more meetings for public input. He admitted that METAexpo represented a superior vision for the site. If and when Magic Plus LLC fulfills the State’s requirements, the plan must then be submitted to the City Planning and Development Department, Board of Zoning Appeals, and to the Detroit City Council for approval. The plan is also subject to requirements governed by the City’s “Community Benefits Ordinance,” passed by voters (as Prop B) in the November, 2016 election. With the decline in confidence in the developer’s ability to deliver, there is a rising chorus of voices that is calling on Governor Snyder to re-examine and reinitiate the entire process. In any event, the plan in its current iteration is economically unviable and should be rejected.